We’ve no doubt all had those situations where we’ve not been able to go food shopping for whatever reason and as a result, there aren’t a lot of ingredients in the house to inspire any sort of extravagant brunch. This usually happens to us when we’ve got friends over to visit and days are spent on the beaches of Fethiye or going out on day trips. Regular routine goes out of the window and all of a sudden, the cupboards and fridge look a bit sad for themselves because we’ve neglected them by failing to replenish dwindling stocks. So now, it’s brunch time, we’re hungry and we’re staring at not very much in the way of food. What to do? Fortunately, for us, we’ve usually got a bit of yesterday’s leftover bread lurking about the kitchen somewhere and it’s very rare that we don’t have a few eggs in the fridge. Eggy bread to the rescue! Let’s say right now; this is not the healthiest recipe you’re ever going to come across – but it is going to get you off to a good start to a day and it really does the trick in the satisfaction stakes. Eggy bread is also common in Turkish cuisine – sometimes, you will see yumurtalı ekmek (eggy bread) served as part of your Turkish village breakfast but for the purposes of this post, we’re making this great simple dish as an emergency brunch which, emergency or not, never fails to please! Turkish bread is very airy and doesn’t contain preservatives so, even after just a few hours, it can lose that fabulous, freshly baked texture. Cutting it into slices and making eggy bread is a perfect way of using up your not-very-fresh bread. This is one of those dishes where Barry takes over in the kitchen. He’s good at this sort of food and, well, our kitchen just isn’t big enough for the two of us! I set the table whilst he beats eggs, chilli flakes and other little additions on a large plate and starts to soak the bread in the beaten eggs. Meanwhile, the oil and butter is gently heating in the frying pan and all manner of condiments and accompaniments are added to the table; salt, sauces and süzme yoghurt. Once all the egg has soaked into the bread, it’s time to add the slices to the heated oil and butter. We know butter is naughty, but we’re all allowed a little naughty food treat every now and then, aren’t we. It just makes for a richer flavour. And after a few short minutes, your brunch is ready to hit the table. Here’s our complete eggy bread recipe for you to follow, should you one day find yourself with bare cupboards, like us…or should you just fancy a little treat, too, of course. A simple but very satisfying brunch. 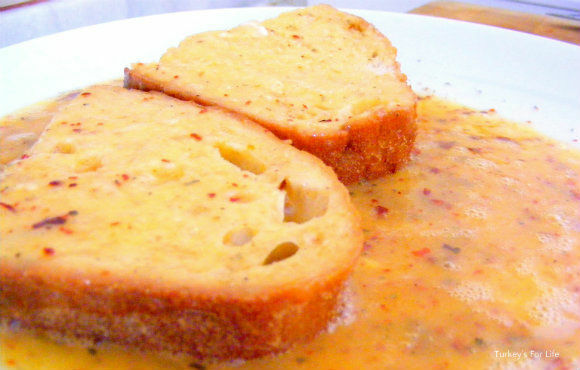 This is a basic, savoury eggy bread recipe common in both British and Turkish cuisine. 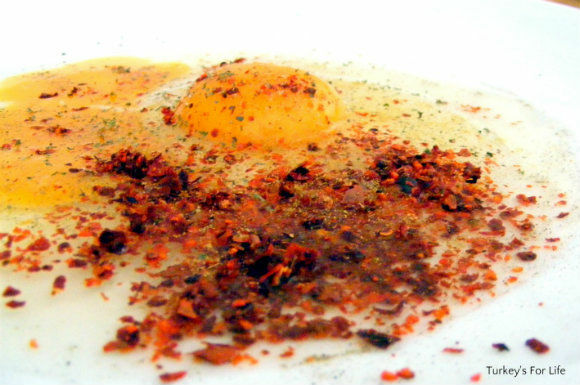 If you like, you can add a little milk or grated cheese to your egg mixture before you fry it. Alternatively, some people like to add sweet toppings, too, such as honey. Standard Turkish bread is light and airy. 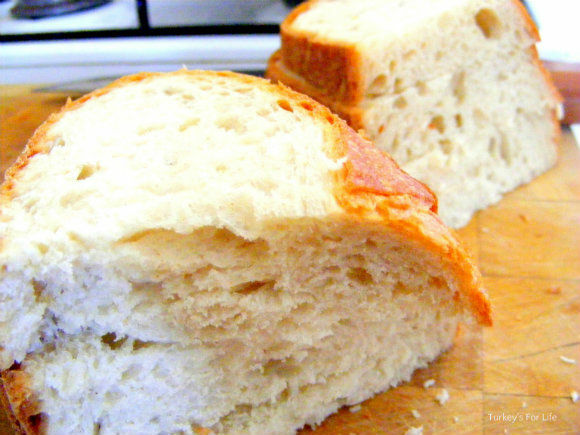 French or Italian bread is also suitable for eggy bread recipes if you can't get Turkish bread. Please note: Nutritional information is approximate values. Now brew yourself a pot of tea, sit down with your knife and fork, salt and pepper and work your way through your eggy bread, marvelling at how to simple ingredients can produce such a great lunch. If you’ve got any süzme yoghurt in the house, a healthy dollop on the side works wonders. Of course, in other circumstances, eggy bread can also be an accompaniment to a bigger meal. It’s lovely served with a mixed salad, for example, but for this recipe, we’re keeping life easy – well, we’re assuming there’s hardly any food in the house, remember. 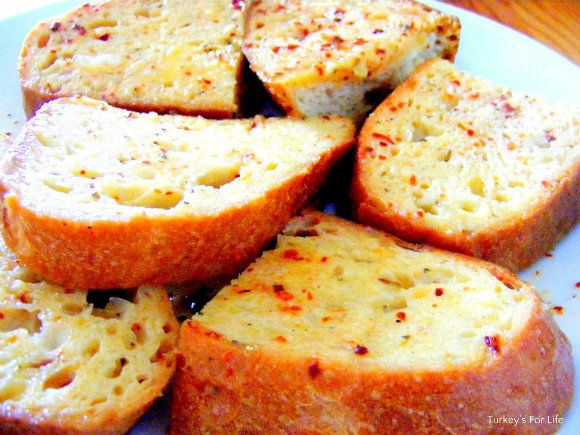 savory turkish french bread..brilliant!!! now i know what i am making for breakfast today! thank you for this recipe! One slice of this and I would be cured. @ jaz: Still breakfast time where you are then? 🙂 Afiyet olsun. i meant turkish french toast! i just made this and my husband and son loved it. what a great addition to breakfast. 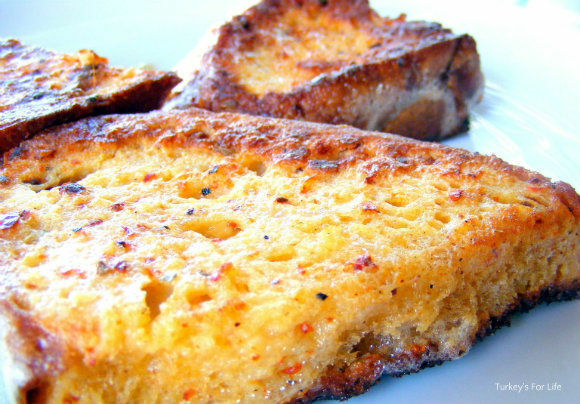 i had never thought about making savory french toast but now my mind is running with ideas! thanks again for this recipe! . . jeez! must have been a heavy session! I’m afraid when I need comfort food it has to be sweet, so I omit the spices and add a dash of pekmez or maple syrup to my finished eggy bread. Even more calories. You can add some milk to the mixture too. Would be good with some cheese in the egg mix, maybe something strong and finely grated like Pecorino.